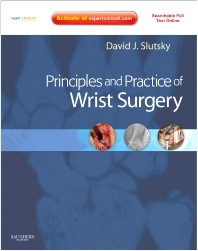 Principles and Practice of Wrist Surgery, by David J. Slutsky, MD, FRCS, offers current, comprehensive guidance for addressing the challenging and quickly growing incidence of wrist injuries. Joined by a world-class team of contributors, Dr. Slutsky presents today’s best treatment options and surgical techniques for a full range of scenarios...from occupational disorders and sports injuries to age-related conditions. Inside you’ll find discussions of the most current developments in minimally invasive arthroscopic and percutaneous procedures, the very latest in locked plating and internal fixation technology, the state-of-the-art in arthroplasty techniques for degenerative and inflammatory arthritis, unparalleled coverage of ulnar injuries and techniques, complications and salvage, compression neuropathies, and much more. A bonus DVD of surgical videos depicts the technical details of each procedure to further help you refine your skills. Expert Consult functionality offers convenient access to the complete contents of the book and DVD online. Provides access to the complete text online, fully searchable, along with all of the illustrations downloadable for your personal presentations, and a link to a video library of all of the DVD videos, at expertconsult.com. Features the practice-proven experience of internationally recognized experts in hand surgery, for guidance you can trust. Equips you with today’s management options and techniques for a full range of wrist disorders and injuries – from trauma and soft tissue injuries...to complications and salvage...to pediatric conditions. Includes a brief basic science section providing just the essential new developments in anatomy and biomechanics to keep you up to date on the latest breakthroughs. Offers a clinically focused, consistent organization throughout—with each chapter addressing a specific injury or surgical technique—making reference easy. Captures intraoperative details as they appear in the OR through a full-color format along with interpretive drawings of surgical technique. Includes a bonus DVD containing surgical videos that depict the technical aspects of each procedure to help you perfect your technique.